Earlier this month I stopped at the mailboxes on my way into my apartment complex and found, in addition to a stack of junk mail waiting for me, an open box laying on the ground. Upon further inspection I saw it was filled with large bags of cranberries and carried a sign that simply said, "Happy Holidays." Some very generous neighbor of mine had set out this box of cranberries for all the residents in our complex to enjoy without any desire to reveal his or her identity. Nice, right? It was inspiring. 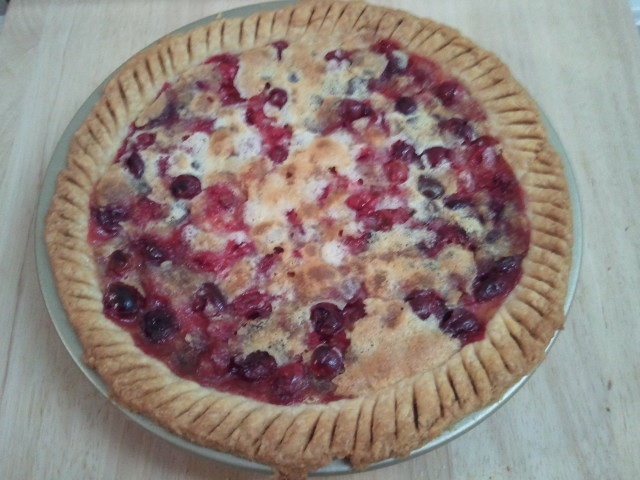 In hopes of passing along this act of generosity, I decided to make a Cranberry Chocolate Pie and send it with my love to a Thanksgiving dinner I wasn't able to attend. According to those who were in attendance, the pie was rich and yummy and a nice alternative to the more traditional Pumpkin pies. Here is the recipe: a combination of many, plus a little touch of my own. Preheat oven to 450 degrees F. Prepare and roll out pie crust into 9" pie pan. 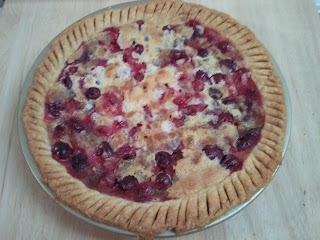 Pour cranberries onto crust to form a thick, even layer. In a medium bowl, sift together 2/3 cup of sugar and flour. In a separate bowl, beat egg white until stiff peaks form, and fold into flour mixture. Slowly add cream until combined. Cover cranberries with remaining 1/3 cup of sugar, and sprinkle chocolate chips evenly. Pour mixture on top. Bake for 10 minutes, then lower temperature to 350 degrees and bake for an additional 40 minutes. Let pie cool before serving. There is something very sweet about baking, and I'm not just talking about the sugar. I'm talking about the sharing. Everyone may get a sweet tooth now and then, but generosity and gratitude are far more addictive ingredients. They inspire similar behavior in others. They move us to pay it forward. It's what makes this time of year so very rich. May our holidays this year be filled with gratitude, generosity, and a little sugar on the side.